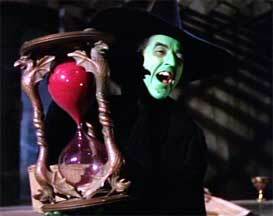 If you thought the witch's crystal ball was created for The Wizard of Oz, you'd be wrong. It first appeared in the MGM movie, Chandu the Magician in 1932. 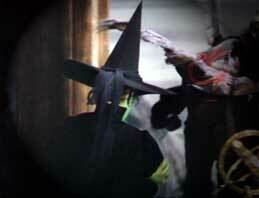 It resurfaced seven years later as the powerful tool for the Wicked Witch of the West. After 1939, the ball was stored in a prop house, where it sat idle for several decades. In 1973, ownership of it was transferred to a science-fiction prop house, but it never resurfaced in another movie. A few years later, it ended up in that prop house's junkyard. It was found by an inventor who had no clue of the ball's history; he simply wanted to turn the orb into a giant plasma ball. As fate would have it, the inventor discovered the true lineage of it, and eventually put it up for auction, around 2011. It sold for $126,000 (some sources say $129,000), and most of the proceeds were donated to the New Jersey Teen Arts Festival at the Sussex County Community College. The ball was hand-blown, about 25 inches in diameter, and is very irregular, mostly egg-shaped. It also has numerous bubbles in the glass, which were used to authenticate it when compared with actual footage from the movies it was in. Today, the crystal ball is safely and beautifully preserved at the Walker Library of the History of Human Imagination. The base that was used in the movie is long gone, but was meticulously recreated for the exhibit at the Walker Library. Yep, those rather dingy looking shoes above are the actual "beauty" shoes that Dorothy/Judy wore in the movie. They're sitting in my closet as I write this...just kidding! They're really at the Smithsonian...just kidding again! Actually the true beauty-shot shoes are in still in California, waiting for their new home in the Academy Museum of Motion Pictures, scheduled to open in Los Angeles, in 2019 (the date keeps getting bumped). They are one of four pair that were worn by Judy in the movie, and they are the close-up pair that zapped Maggie when she tried to take them. Purchased at auction in 2012 mainly by Leonardo DiCaprio and a couple other Hollywood BigNames. The price tag is a secret...if you had to ask, you couldn't afford them. They're worth a cool $3,000,000. 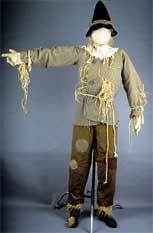 Ray Bolger had ownership of the scarecrow costume he wore in the movie. Gwendolyn R. Bolger, Bolger's wife, donated the costume to the Smithsonian in 1987. She also donated a bag of the "straw" to the museum. While the Smithsonian does indeed have these goodies...they're not on display. This situation is about as useful as having all these props in the hands of private collectors, where nobody else can ever see them again. Unfortunately, likely gone forever. It's never surfaced, so it was probably destroyed or is lost (how does something like that get lost?). I know that MGM, after it auctioned off its Wizard of Oz props and assets back in 1970, simply threw away other things in the mid-70s...like the matte painting of the Emerald City, shown in the distance after Dorothy and company wake up from their poppy trip. MGM contractors carefully tossed the painting into a dumpster and hauled it away. One of the haulers grabbed it, saved it, and put it up for auction in the 1990s, where it sold for $44,000. At left is a bar of soap. It dates back to 1939, was hand-painted, and it's mine. Willard Carroll, who has the most extensive collection of The Wizard of Oz memorabilia in the world, owns it. At an auction, he snatched it from the Gloved One, Michael Jackson, who had placed a cap on the amount he was willing to bid. Big mistake. Willard got it for $80,000...I'm guessing that this amount was pocket change for Jackson at the time (about 1993). You can see and hear the full story from Carroll himself at this website. I won't beat around the bush: This was supposed to be mine. It went up for auction in June 2017, and everybody thought it would sell for between $8000 and $12,000 (which seemed cheap). But I was willing to do it; if needed, I considered selling my services as a genius mathematician (I'm an idiot at math, BTW) just to afford it. It sold for $22,500 plus another $6300 in fees. I don't know who owns it now...they can take the spear that *I* was supposed to buy and fall on it (and that would take some major bumbling). Anyway, it's an original prop spear, made out of metal, and measures 30 by 11 inches. It was originally acquired from the 1970 MGM Studios auction. There are three known hats in existance, and not one of them may ever come up for sale again. All have, at one time or another, been auctioned off by Joe Maddalena, of Profiles In History. The very first person to be offered a chance to buy the hat (probably the one most worn in the movie, but that fact remains unclear) was Maggie herself. This was back in 1970, when MGM decided (rather foolishly) to sell off the assets from the film...before tossing many of them in the dumpster. In the 1980s, Maggie admitted that she declined the offer because she felt the props used in the movie should be in a museum. The last hat sold at auction (in 2010) was estimated to bring in $100,000 to $150,000. It sold for $230,000, which was slightly more than the $33,000 the previous owner paid twenty years earlier. Who owns it now? I don't know.